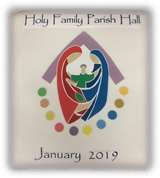 On the afternoon of Tuesday January 29th 2019 Bishop Mark O’Toole visited St. Peter, Prince of Apostles, Church, Budleigh Salterton to celebrate Mass and to bless the Holy Family Hall. St. Peter’s looked especially beautiful with floral arrangements gracing all parts of the church. There was a large congregation attending the service and parishioners from both St Peter’s Church and Holy Ghost Church Exmouth were in their seats early. Guests included the Town Mayor, Cllr. Tom Wright and his wife, ministers from other churches, Father Robin and his wife Anne, Sisters from the Holy Family Convent, Exmouth and other guests from the wider community. At 2.30.p.m. the congregation stood as Bishop Mark entered in procession, preceded by Geoff Paver, carrying the processional cross, Father Philip Austen, Deacon Terry Enright, and the Bishop’s secretary Mgr. Keith Mitchell. After welcoming everyone, Bishop Mark thanked the congregation for venturing out on such a wet and windy afternoon. He said he was pleased to be back at St Peters. He explained that he had first visited the church just after he had been appointed Bishop and said he had been looking forward to coming back to Budleigh Salterton ever since that first visit. In his homily the Bishop said how wonderful it was to be celebrating Mass in a church dedicated to St. Peter, Prince of Apostles. 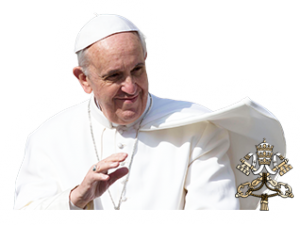 He explained that last year he had spent time in Rome with Pope Francis, the successor to St. Peter, along with the other Bishops of England and Wales. He said that the main message the Holy Father had wanted the Bishops to bring back to the faithful in their dioceses was to tell them to be joyful. The Bishop then thanked the congregation for all they did in their personal lives to strengthen their faith and to deepen their personal encounter with Christ. He then went on to explain how the new hall can be an outward sign of the faith of all inthe parish. Before giving the final blessing Bishop Mark explained that when all the Bishops of England and Wales were blessed by Pope Francis before leaving Rome, the Holy Father had told them that his Papal blessing was to be extended to everyone in the parishes the Bishops visited. At the end of Mass, Father Philip said it was wonderful to have such a large congregation despite the weather. He said he was delighted that the hall was finally finished and he thanked the Bishop for coming to bless the hall. He then asked everyone to make their way to the new hall and invited them to stay for refreshments. Father Philip opened the Order of Blessing with a prayer asking that the hall may be a place we ‘come to know one another and give witness to our faith in Christ’. This was followed by a reading from the Letter of Jude. Deacon Terry then said bidding prayers thanking the generous benefactors and praying for all those who will use the hall. Bishop Mark then blessed the hall and hung two crucifixes on the walls. After the blessing there was time for everyone to chat with their fellow parishioners and to partake of a glass of prosecco and the delicious celebratory cake. Bishop Mark mingled with the huge crowd and it was wonderful that everyone had an opportunity to speak with him. The whole parish owes a huge debt of gratitude to Father Philip who has worked tirelessly in bringing this exciting project to fulfilment. It is to be hoped that the new hall will be a place where new friendships are formed and where participation in parish life will be deepened.